As a benefit of club membership, members who dues are paid up receive two free ads per year, which run for a calendar year. In the newsletter, the ads run as text only. On the website, members may include two photos per ad. Additional ads are $10 each and include two photos. Contact Mary Ellen Gray or Heidi Harvey for more info. Unless otherwise noted by advertiser, you may assume that the horse is a registered or registration pending Morgan. Please note that the WMHC is not responsible for the content of the submissions received or for incomplete or misleading information. Pricing and availability of advertised stock and items is subject to change without notice. Please contact the person designated in the ads for further information. Saddletime Creme Brûlée (Saddletime Justified x FTR Vanilla Star) 2009 palomino mare. 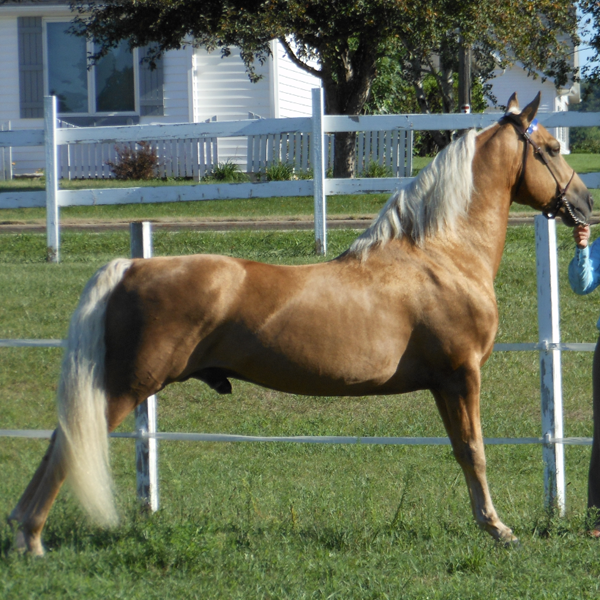 This beautiful palomino mare is reluctantly offered for sale. She was purchased to be a broodmare and although she had a beautiful chestnut filly this spring, she rejected her after 24 hours. She was nervous of the stallion too and it required AI and two years to settle her. She has had trainingwith Daryl Hobson and was used as a school horse by Candy Morasch at Saddletime Stables. She had a tune-up with Jim Riggs for a month when being bred in 2017. She has all her gaits and cues, collects herself, has a true flat walk and true jog, likes people and attention, and is gentle enough to be ridden by a pre-teen or teenager. I am planning to put her in the barn with Amy Ziegler so she can be ridden by prospective buyers as soon as the weather moderates a bit. A good home, preferably with a young person, is a must. It need not be a show home but she would make a spectacular western horse so I would also consider a lease arrangement for the show season with a good home. Asking $6500, negotiable. Contact Heidi Harvey, Oldfield Morgans, at (617) 529-7226 or heidiharvey@comcast.net. JKM Glori-Anna (Ragtime Doc Holliday x Prairie Hill Prima Donna) 2014 smoky black filly. “Glory” is an in your pocket filly! She is so sweet, and loves being by you! Glory has good conformation with nice angulation to shoulder and hip. She could be your future show horse or that special family trail riding friend. Glory would excel at whatever disposition chosen for her - great mind! She was imprinted at birth, up to date on shots and worming. Asking: $3,000. Please visit our website www.char-danmorgans.com for more information and pictures. Oldfield Wild Iris (Hylee Galaxy's Wild Irish x Bethlehem Morning Glory) 2013 bay mare, 15h. Iris is an elegant, finished show horse who was Top Ten , World Champion 3 Year Old Western Pleasure in 2016. 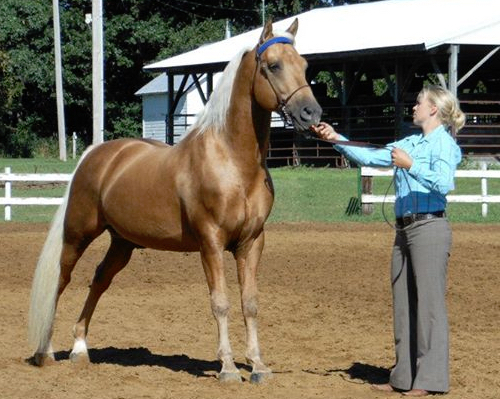 An in-hand reserve champion as a yearling, she grew up beautiful with a great work ethic. She will go in a snaffle, curb or bosal. Ready to take in any western pleasure or western dressage discipline. She is one of the few finished horses by Hylee Galaxy's Wild Irish available on the market, but she won't be for long. She'll be bred and off the market in June so if you need a western mare for your show string, this is your chance. Asking $8500. Contact Heidi at (617) 529 7226 or by email. More pictures and information are available at our website www.oldfieldmorgans.com. AE Sargent Pepper’s Heart (ToRoy Golden McClintock x T-Valley Tanya of Tatras) 2014 smoky black gelding. This gelding has a great start and is responsive with his ground manners and cues. He is a proven cross in temperament and versatility. His color is a stunning copper black tone with handsome soft eyes and tipped ears. Had 60 days training to advance in some saddle basics and working on ground driving/riding trails. He is bold, accepting and eager to please. We feel he would be an ideal Western type mover to advance in Cowboy Dressage, Ranch Work, all around, trails/distance or versatility to match his riders goals/ability. Contact Jessica (608) 865-0451. www.aestheticequine.com. Dancastle Legend (Dancastle Icefalcon x Dancastle Legacy) 2015 chestnut stallion. Four-year old sport Morgan stallion, 99% foundation--old Gov't/Brunk/JacksonRanch -- with a great mind, impeccable ground manners and tremendous athleticism. Should mature over 15 hands. Red has been started in harness; he carries the now rare sire line to Trophy. He placed 1st in the 2015 Illinois State Fair Morgan Futurity. Pedigree at allbreedpedigree.com. Located Crystal Lake, IL (30 miles SE of Beloit). $1500 OBO. Email June or call (815) 405-9424. MSD Hot Rod Lincoln (Minnion Millennium x Bonnie Lee Trudy), 2015 bay gelding, 26h. This is a big, beautiful, smart gelding by leading Morgan sire Minion Millennium, Pretty head, well positioned neck with nice length, laid back shoulder, short back, excellent hip, clean refined, correct legs. Happy and willing disposition, he would be a gorgeous hunter, pleasure, dressage, or western dressage prospect. Hot Rod has a good start in harness work and is currently starting is saddle work. Two rear socks and a faint snip. $8000, Call or text Dale and Sue Hammonds, (929) 765-1499. SDH Cadillac Jack (Red Rose Moonshine x Cosmos Sweet Wishes (by Three Wishes out of Treble's Sweet Memories), 2015 palomino gelding, 15.2h. Pretty, pretty, pretty. You can see the Tug Hill Commando and Treble's Willy Wild pretty coming through in this pedigree. Jack is happy, cooperative and willing to please and very sweet. Wearing silver in the western division is in this youngster's future. He has a good start in driving and is starting his saddle work. $6500. Call or text Dale and Sue Hammonds, (929) 765-1499. JKM Special Delivery (Ragtime Doc Holliday x Oak Creek Reminiscence) 2013 chestnut gelding. “Cole” has a lot of eye appeal with the white on his face and two white socks. He has enough chrome to catch a judge’s eye. He carries himself very nicely. Cole has sound legs, good feet and conformation. He is young enough to mold into a nice show horse or become someone’s trail partner. He is very friendly and likes attention. He likes to be with you. Cole is updated on shots and worming and was imprinted at birth and is handled daily. Asking: $3,000. Please visit our website, www.char-danmorgans.com for more information and pictures (3/17). Cedarcrest Valentino (Ultra’s Special Agent x WGF Cajun Flaire), 2008 Bay stallion. (This one-of-a-kind stallion proves time and time again what it means to be a textbook Morgan stallion with all the Morgan charm. His drop dead gorgeous expression, strong conformation, and incredibly bold movements are just as awe inspiring as his kindness and intelligence. The best part? He passes on each of these traits onto his get, and although is foal crop is still young, they have already began filling in their sire's footsteps, racking up wins in-hand and pleasure driving at Morgan Masterpiece and North Star Americana. His son, Cedarcrest Code of Honor, is also standing at stud and you can see his photo below. "Rudy" himself is no stranger to the winner's circle, he has won many times in English Pleasure, Pleasure Driving, and Park at shows such as the Morgan Grand Nationals, Morgan Masterpiece, Illinois State Fair, and North Star Americana. Some of his most notable wins being National Champion Four Year Old Stallion at the 2012 Morgan Grand Nationals and undefeated champion in Pleasure Driving and English Pleasure at IL State Fair two years in a row. 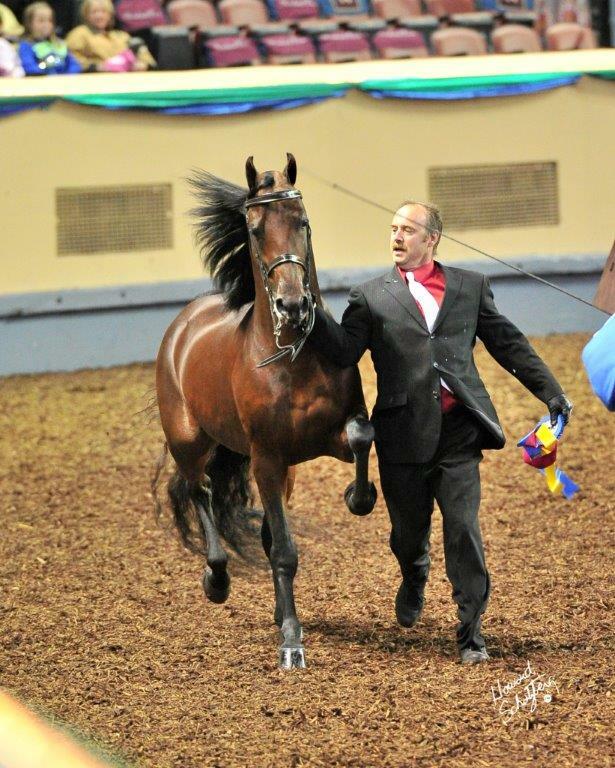 He is our go-to horse to show off and introduce new people to the wonders of the Morgan breed, whether it is at events such as Midwest Horse Fair, clinics, club meetings, or introducing new clients. His kindness stretches out to even giving lessons to intermediate and advanced riders/drivers on occasion who wish to learn more about the saddleseat and driving disciplines. On top of his Morgan charm and attitude, Rudy's beauty and raw power takes one's breath away, whether he is driving or riding. We truly cannot say enough about this stallion, and he just keeps getting better with time. Email Anita or Jeff Fanscali, Wingait Farm, or call (608) 963-2828. Cedarcrest Code of Honor (Cedarcrest Valentino x Clearly Liberated ), 2014 Bay stallion. New to the breeding shed, Cedarcrest Code of Honor is beginning his breeding career after a successful show career. This big, stretchy son of National Champion Cedarcrest Valentino (Ultra's Special Agent x WGF Cajun Flaire) is out of a Serenity Flight Time granddaughter, and his pedigree boasts of the best. A wonderful mix of older Morgan lines and the Noble Flaire lines, Sven will cross well with any mare. "Sven" gets noticed everywhere he goes, with his big size, interesting coloration, and his flashy chrome against dark bay coat. We have high hopes for this young stallion, who is beginning to live up to his sire's standards. 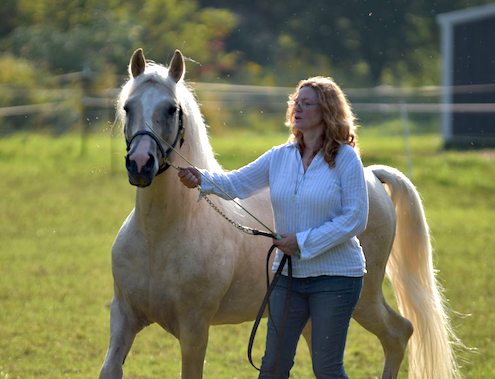 Easy to work with, Sven is also a kind stallion like his sire, recently helping an amateur, who has not shown or driven horses in decades, get back into the show ring. If you're looking for big, gorgeous, and kind, Sven is the stallion for you. Email Anita or Jeff Fanscali, Wingait Farm, or call (608) 963-2828. Kells Above R Expectations (Spring Hills K C L x Kells Moonlight Serenade) 2003 black stallion, 15h. 100% foundation breeding. Sport movement, extreme type, exceptional disposition. Jake's offspring are excelling in dressage, jumping, and driving. They are quick to learn and easy to handle. We believe he is homzygous for black as he has no chestnut offspring. Stud Fee, $500 LFG. Contact Leon or Cindy Kells, (651) 388-1256 or (651) 301 1455, Flower Valley Morgan Farm, Red Wing, MN, www.kellsmorgans.com, fvmorganfarm@aol.com. Ragtime Doc Holliday (Robbie Sue’s Ragtime x Mary Mels Irish Velvet) 2005 smoky black stallion, 15h. If you desire classic Morgan, considering breeding to “Doc”. He epitomizes classic Baroque Morgan with his proud, upright carriage and wide soft, expressive eyes! He possess intelligence, athleticism, a gorgeous floating trot, sound legs and good feet. Doc is very easy going, learns quickly, and is respectful. This he stamps on all his foals. He also carries the cream gene for a chance of color. Stud fee: $500/LFG. For more information visit our website - www.char-danmorgans.com, or call Jarrett Miller at 763-444-6880. Krutzmann Marathon Vehicle. Lovely, sturdy, Polish-made, cob-sized. Was used with a 15.1 hand, solidly built Morgan. This vehicle was purchased new in 2013 and used a few dozen times over a few years (no accidents) - then stored under roof. Rides nicely, with a front seat that can be set up for either a single "wedge" seat, or room for two. This vehicle will be a reasonably priced way to get a 4 wheeled vehicle for every day use, or for competition. Located in the Wisconsin Dells, WI area just off I-90/94. Contact Eleanor at 608-963-4573 or chiquoines@gmail.com for details and pricing. Electro-Groom® Horse Vacuum with Booster Power. Lightly used. $400. Call or text Debbie Fairbanks at 608-214-6916. Located outside New Glarus, WI. Carriage Driving Whip. Single horse hollow fiberglass driving whip. Suitable for Carriage Shows. Lightweight and balanced. Black grip with brass end. White spun lash. Excellent condition. Used 6 times. 68" to top of bow with 24" spun nylon lash. Was $95.00 new. Asking $45.00. Contact Judy at 608-393-3938 or tomandjudyt8@charter.net for more information or pictures. Meadowbrook Driving Cart. Horse Size. Made by Eberly Coach Works in Wisconsin. New, only driven 3 times, veery clean and ready to go.. Beautiful hardwood, rubber covered wheels. Easy entry lifting seat. Versatile enough to be driven in arena and on trails. Fits standard size horse. Balanced, easy to pull and very tough. Stored 100% inside.. Asking $1000. Email Katz Jackson or call (608) 577-8468.